Gazebo built by Staff and Inmates of the Junee Correctional Centre for the Regional Transport Heritage Association-Junee Inc. commemorates the 50th birthday of the Junee Roadhouse. The Gazebo is dedicated to Railway Employees. The Junee roundhouse, or loco, as it was called, was the last steam depot built in NSW and as such was the pinnacle of steam depot development in the state. Steam soon gave way to diesel power and Junee loco was accordingly modified and steam facilities such as the coal stage and de-ashing pits removed. The main feature, the roundhouse, remains. Centred around the unique 100 ft (33 m) turntable are two sheds and 42 tracks including the high-roads and machine shop. Today the roundhouse is home to Junee Railway Workshop, a local company that maintains and repairs rolling stock and locomotives for hire and for other operators. 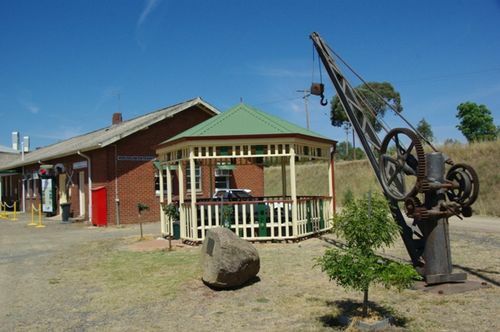 Other parts of the roundhouse are occupied by Regional Heritage Transport Association Junee - Inc. who operate a museum dedicated to local railway history on the site. for the Regional Heritage Transport Association - Junee Inc.